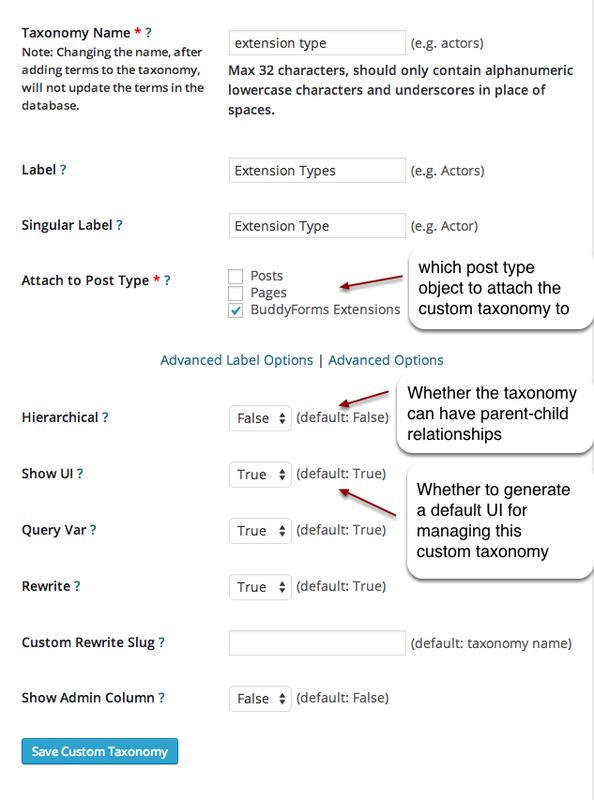 In this tutorial You will learn an easy way to create a new post type and taxonomy to use with BuddyForms. Install and activate the CPT UI plugin. To create a new custom post type click on the "Add New" button in the left sidebar of your WordPress admin under your CPT UI menu. Fill out the form. If you want to adjust the settings of the custom post type, click on the 'Advanced Options' button under the form. In this example we want to create a new public post type to create an user driven directory site. We want to display the post type in the frontend and we need to have an archive view for our directory. The directory works the same way normal posts are working and has the same views (pages) and form elements. If you want to create a new post type similar to the posts in WordPress, you can use this example and adjust it to your needs. The taxonomy is created the same way the post type is created. Please see the screenshot above for detailed information. There is also a great inline documentation available in the CPT UI plugin if you move the mouse over the "?" In this example we wanted to create a new categorie for our directory site.